10 Lessons I Have learned In 10 Years of Teaching | So You Want To Teach? At the conclusion of 10 years of teaching, I started to reminisce about what I have learned. 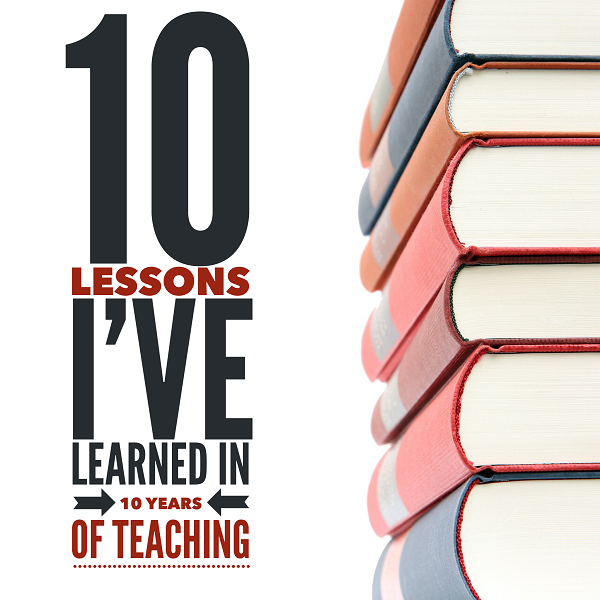 This article summarizes 10 lessons I have learned in 10 years of teaching. After having successfully completed my tenth year as a professional educator, I have come to realize that a lot of what I used to think worked didn’t really work…at least not long-term. While some things may be effective in the immediate future, they are not sustainable down the road, and sometimes even backfire if used to often and too early. No matter how hard you try to pretend you love your job, if you don’t, the kids will see right through you. Students feed off of the energy that the teacher gives off in the classroom. If you love your job, they will know it. If you hate your job, they will know it.If you want to know what the general consensus of your students is about anything, you can probably ask them and they will tell you. Younger students especially have no filter installed. Sometimes you don’t want the answer, but it’s always revealing. HINT: Here are 50 reasons to get you started. This skill was tremendously difficult for me to learn, because I am so prideful that I like to “show them right” or let karma have its way or whatever. But instead, I have grown to where I try to reach out and like every student who walks through my doors every day. It will pay off in the future. This is one of Dr. Stephen R. Covey’s Seven Habits of Highly Effective People. It goes something like this: If you are nice to other people and give them the benefit of the doubt, that they will be able to trust you and let you take care of their learning. Their respect for you will also grow, and you will have far less discipline issues. This applies in so many areas. Of primary concern here is that one of the biggest issues many young educators encounter is that they have a difficulty with “pacing” their lessons. Three key elements of this have to do with how quickly they move through the material, how much silence they have while they are teaching, and how quickly they speak.As long as you know where you are going with the lesson, the issue is usually not that they are moving too slowly and therefore allowing discipline issues to crop up. On the contrary, younger teachers often move too quickly, don’t allow enough “mental breathing room” for the students so that what the teacher just said has a chance to set in. I have observed this to be particularly a problem for students younger than 8th grade. Slow down your speaking, overpronounce the words, and wait a little bit longer than is comfortable. Try it and see what happens! One of my greatest challenges is when I tell a student to do something and they don’t do it right away. Too often I have told students to stop talking and they finish their sentence before they stop. I am confronted with a choice. I can either thank the students for being quiet, or I can complain about the slowness of their response. In my younger days (and occasionally even now), I would go with the second choice. But….Which of these two options will better facilitate learning in the classroom? Bring too many extra reeds to marching contest. Overplan your lesson. Make too many copies for the substitute. Alert your principal about a potential upcoming parent conference. Call transportation to confirm the buses for the field trip one more time.After all, would you rather save money now or have some extra toilet paper later? Fire drills. A student coming in after missing a test in my class with a note explaining that she was finishing up a test in her math class. Even sixth graders wet their pants sometimes. Bus tires don’t always stay inflated. “I can’t go to the concert because my parents bought tickets to see the Star Warspremier that night.” “You can’t have a concert in the cafeteria that night because of a conflict…how about the Friday before Memorial Day?” “I can’t go to the concert the Friday before Memorial Day because my family is going out of town because my uncle’s neighbor is having surgery on Saturday afternoon.” “I need a new marching uniform because I was only four weeks pregnant when we got sized back in August.” “We’re pulled over on the side of the highway because the bus drivers don’t know how to get to the stadium.” “I know contest is tomorrow, but I got my braces off today! See how straight my teeth are?”Yes, all of these have happened to me. When kids fight, the fight ends soon enough. Why risk injury just to be the teacher who broke up all the fun? Some parents just complain so they can hear themselves complain. And there’s nothing wrong with letting them have their time. After they finish, thank them and let them know that if there’s anything else you can help them with, they are more than welcome to stop by any time. Who knows? You might gain an avid supporter that way.On a side note, if the fire is not put out, be sure it is a controlled burn. Watch to make sure it doesn’t get out of hand. If it appears to be to that point, stomp it out as soon as possible, lest it spread too far and too fast. Watch what you eat and exercise 30 minutes a day. No school district is worth you sacrificing your health and longevity over. So there we go. Leave some of what you have learned in the comment section below! Joel Wagner (@sywtt) began teaching band in 2002. Though he had a lot of information, his classes were out of control. He found himself tired, frustrated, disrespected by students, lonely, and on the brink of quitting. He had had enough. He resigned from his school district right before spring break of his second year and made it his personal mission to learn to be a great teacher. So You Want To Teach? is the ongoing story of that quest for educational excellence. No comment, but a question. How on earth do you not have hours of work at home each night? I have so much to do and lessons to revamp that I am working 3-5 hours a night. The weekends don&apos;t bring much relief. I am a 20 year veteran and have so much required work, it is impossible to do it at school. Congratulations on your tenth year! I am finishing up my first year and I have an even bigger respect for those who have been teaching for many years! The past few months have been very hard for me, and there were too many moments where I questioned whether or not I could continue doing this for another year, much less til retirement! You have great points. #2 and #10 were especially tough for me… It takes a lot of conscious effort to remember not to overdo it at work and remember to take care of both my emotional, and physical health. This post provides some great tips on how to be the best educator possible. I am an educator myself and love working and engaging with kids on a daily basis. I also use all of the tips showcased in this post when I teach. In developing my Math and Memory System, Brainetics (www.brainetics.com), I focused on making my techniques fun and engaging. It is important that students actual enjoy learning. This was great post. Keep up the great work! These are some great lessons learned; however, as the first comment attests, academic teachers do have two to three times as much as much (or more for some) work to do to prepare for and to assess their students as any teacher in any other elective course. In my 30 years as an educator, I have been a high school English teacher, a junior high and a high school assistant principal, and a middle school and a high school principal. In every case, I have the perspective to know how much work the academic teachers have versus others (including all the prep work and the after school practice and performance time spent by band and chorus and theater directors (I also taught drama and put on school plays several years, was a cheerleader sponsor, yearbook sponsor, basketball coach, and scorekeeper and statustics person for several other sports). Even with all the after school "time" that these folks spend (and it can be considerable), it doesn&apos;t come close to the time that the academic teachers must put in to their classes each week (and great teachers put in even more hours than the average). The time they must spend now developing assignments and activities, getting materials together, making sure65-70 percent of the assignments they put together for any unit or concept includes enough rigor to meet the proficient level of the standards they teach. Then they must assure that the assignments are engaging, real-world, hands-on, relevant, and useful to their students (meaning they have to revise their assignments each year to meet their students&apos; needs when before, teachers could put together a file cabinet of lessons they would use from year to year. Not any more. Now the lessons must differentiate for their ESL or special needs students (which are different every year), and there are plenty of other dilemmas that hit them just as hard as the examples you gave. The technology they were going to use for their lesson will not work, the bulb in the data projector just died and they can&apos;t use it. The lesson they need to do in the library can&apos;t be done because the book fair is this week or some teacher training is going on there, there is no auditorium in most schools, so they have to use the cafeteria if they want to have students act out plays, or such, and although they check to make sure they can use it, the district has decided their school is the best place for some district intitative and is using your cafeterial for the opening meeting iwth the bus drivers in the district. There are fire alarms going off, or a bomb threat was called in or the teacher can&apos;t get online to show the necessary Internet links. There is something all the time. And if the teacher happens to be in reading, English or math, and in some states now, also sciene, then you have to get your students ready for the big state test or the end of course test in your subject (only a few EOCs are required or developed in most states), and those teachers have even more pressure to not only develop the best activities and assignments, as well as the best assessments that will assure their students are ready to do well on the test. They are often required by the princpal or superintendent or district-level person to have their students complete test-prep materials and assignments that the teacher doesn&apos;t believe is necessary and often takes up a fulll month of their class time. Academic teachers are just as proud as the band director, but their outcome is more serious and more important to everyone than the shows or the contests or the games or the plays that all the other teachers and coaches work so hard to put on. Their outcomes are put in the paper, but not in the sports section or the "what&apos;s going on?" entertainment section, but rather, on the front page, where students&apos; scores are released and schools are evaluated based on the test scores of their students. When they aren&apos;t as good, if they don&apos;t make "adequate progress", then the school gets a failing grade. This is serious stuff. It makes the 10 lesson learned pale in comparison to lesson learned by the academic teachers. Some you have listed are correct for every teacher, and you have learned some powerful things about teaching young people; however, the part about not taking your work home is so foreign to those who have to take home work every night and every weekend just to stay afloat. I heard someone on the radio the other day coming home say that teachers shouldn&apos;t be paid as much and shouldn&apos;t be allowed to retire after working 30 years because people in the private sector have to work until they are 65 to get their retirement benefits. He said that teachers in China teach much larger classes than those in America and they get better test scores, so our teachers should be made to teach until they are 65 and should have class sizes of 45 or more. For the first time in my life, I called in to a radio program to attest both his issues. Teachers in China do have larger classes. Their students are quiet, well-mannered, and never speak unless their hands are raised and their teachers give them the floor. Teaching in that country is a revered occupation. Education is the most important thing in Chinese families life. As soon as the students get home, the parents are helping them with their homework and requiring them to read on their own. They value education above all else, and soccer practice or little league is something that is done on weekends, after all homework is complete. Schools there begin every student with a musical instrument, and arents have a responsibility to provide additional practice or private lessons in order for the students to become at least proficient in some musical instrument. Chinese and other Asian students attend school for 8 hours while ours attend no more than 7, and their school year does not have a summer vacation. They do not have to spend 6 weeks reviewing the former grade level before moving on. They pay teachers one of the highest wages in the country. But even more importantly, teachers in Asian schools are revered and respected by the school districts, the students and the families. School districts require teachers to teach larger classes, yes; however,these same teachers actually teach only half the day or less. The other part of the day is spent with other teachers planning lessons, grading assignments, sharing and evaluating student work and each others&apos; assignments to make them better. They have time to give feedback to their students and to their students&apos; work. They have time to work with other teachers (new ones with experienced, veteran teachers, to develop great lessons together and discuss how they were taught, how the kids responded, were the lesson successful or not. They spend half their day in this setting; whereas, American teachers have 40 minutes to get everything done, and do not have an opportunity to meet with any of their other colleagues except after school, on their own time, or not at all. The setting is so different, and they get MUCH better results. So do many other countries. But if you look at what they do verusus what we do, so much of it lies in the culture of respect for education and educators. In the value we place on learning and on making sure they give teachers the TIME it takes to plan great lessons, not just throw information out there and see where it sticks. In these other countries, calls home get immediate attention and results, not angry parents who doubt every teacher and defend their children as innocent of any wrong doing and of being picked on by teachers, not apathetic parents who say that "look, I don&apos;t have time to teach my kids at home or help them with their school work. I have a job, too. Your job is to teach my kid, so you do that at school. If he doesn&apos;t learn, that&apos;s your fault. "These parents do not assist their children, set an example to respect their teachers or work hard at something to get it right, they provide excuses for their children to be lazy, to not work hard, to goof off and be bullies to others, and to blame teachers for the ills of society. The caller who so disrespected teachers was typical, and that is the shame of this country. Band teacher, I&apos;m glad you have learned such great lessons, but I wonder what lessons you would have learned if your setting would have been different. If you had had 30-35 kids sitting in classrooms sized and designed for 24, taking a course they didn&apos;t like, didn&apos;t WANT to take, wasn&apos;t good at it and didn&apos;t want to get better, were disruptive constantly, and where you had to deal iwth getting a specific set of standards across to students who would take a state test on their subject at the end of the year to see how much the had learned each few weeks, and your scores were published in the paper at the end of the year. If you had students who were absent 1/3 or more from your class, students who didn&apos;t speak English or had a wide range of learning disorders or seriouos mental illnesses or retardation. I wonder what your lessons would have been if you were supposed to meet with other teachers of your subject on your own time at least once every week to discuss assignments and assessments, district initatives, where they were going to fit in the new literacy plan that had to be implemented this year as well as the new behavior initiative that pulled so many of theirs students of our class. I wonder what lessons you would have learned if you had to teach to a state assessment that was unclear and if your students had to virtually site-read every part of the year-end state assessment and could not show what he/she had already learned so well, but rather had to bubble in A, B, C, D or E to questions you may or may not have given to your students in the same way they are asked in the test. A test you can&apos;t look at or see which answers your specific students missed — only total responses from your total students. And then to get better, you don&apos;t get to work with those same kids you had last year, you have to get a whole new group in each year. Instead of following the same students to see if their scores are improving each year, the way the system works is that you get a whole new group the next year, and you are evaluated on whether you get the new ones coming in to make a higher score that the old ones going out! That&apos;s how the system works. You have to learn all about these kids again, you have to figure out their learning styles, what&apos;s going on at home or with girlfriends that are making your kids crazy and not want to learn. And your job is to get this new group to score higher than last year&apos;s group did each year. A silly, silly way to evaluate, but that is how it is done. Some states are moving to a "value-added" system, but these are few and far between. Mr. Band teacher, I honor you, because my son was in band every year of his life from sixth grade through graduate school. He loved it and he made it his career. He is now a professional trumpet player scratching out a living in this incredibly difficult economy. But he loved band, and his mom loved that he loved it because I knew that he would always be around other great kids and have positive influences in his life, but the band life was an easy one. A pleasant one filled with mutual respect. His academic classes were not. They are totally different, and the preparation needed to teach those classes was completely different than your preparateion (I have a dear friend who is a band teacher, so I know exactly how much time and effort he puts in designing his shows and selecting music and getting his kids to practice and encouraging parents to get their kids into private lessons. But I also know the effort of the academic teachers and I know that while a few of your lessons are good for them, and I hope they have learned those, there are several others they would have had to learn in order to be successful.